This week features two very different, but very interesting auctions. 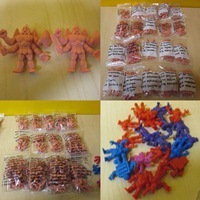 The first auction, Muscle Men Complete Set 236 + Extras 2x Satan’s Cross Bagged Numbered 392 Total, is as “classic” of a M.U.S.C.L.E. auction as possible. 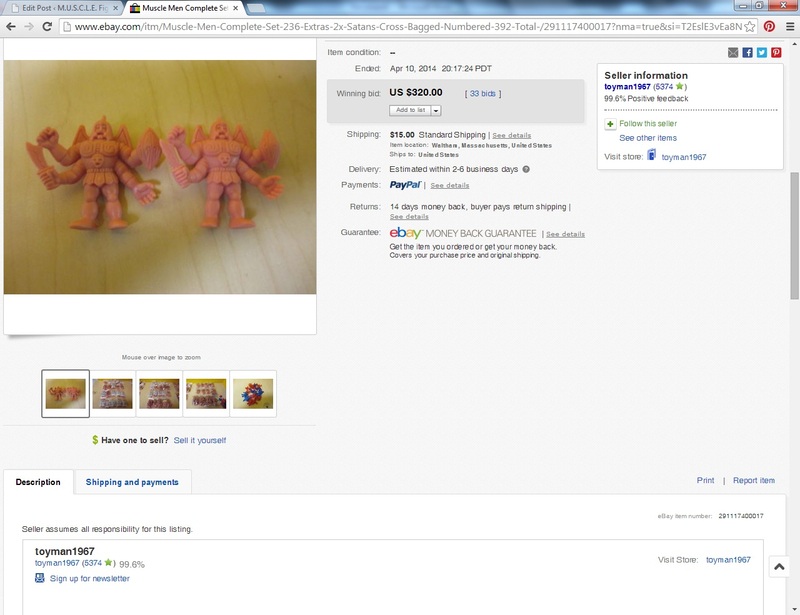 It is a very large lot of figures, mostly Flesh, with Satan Cross, and a fair starting bid. If it wasn’t for the organization and calling special attention to Satan Cross this could be an auction from over 10 years ago. This lot is well worth over a $1000.00 if sold individually or in smaller lots, don’t miss out on this nice collection of figures. Sellers love to overvalue their items. Sellers love to make outlandish claims. 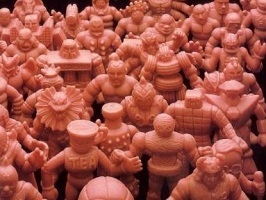 This is arguably one of the most outlandish overvaluing of a M.U.S.C.L.E. auction in recent memory. Suggesting that the lot is worth “well over $1000” is so unfathomable it deserves further exploration. The first auction is a great lot of figures. It will have plenty of bidders and the final price will be a fair amount of money. But the seller has also provided one of the most laughable sentences in an auction description ever. 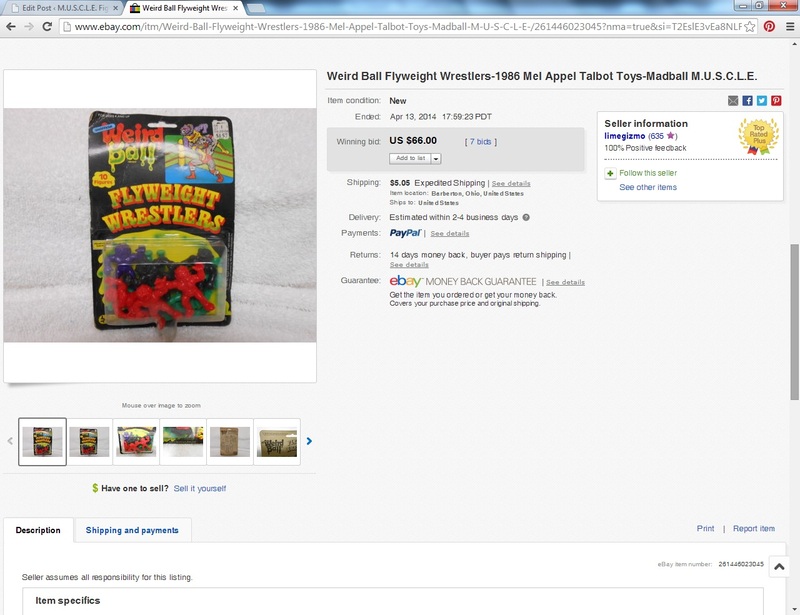 The second auction, Weird Ball Flyweight Wrestlers-1986 Mel Appel Talbot Toys-Madball M.U.S.C.L.E., clearly isn’t a M.U.S.C.L.E. auction. But Weird Ball figures have been mentioned several times before. 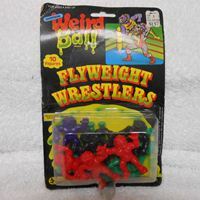 In fact, the last carded Weird Ball figures sold for $41.55. Admittedly it did not appear to be in as good of condition. As of writing Auction Watch #148 there are approximately 4 days left in the second auction and the price is already $66. How much higher will the price climb on the second auction? Even in slightly better condition the price tag is about 59% higher than the last documented example. It becomes very hard to believe it could climb much higher – but stranger things happen. This entry was posted on Wednesday, April 9th, 2014 and is filed under Auction Watch, UofM News. You can follow any responses to this entry through RSS 2.0. You can skip to the end and leave a response. Pinging is currently not allowed.